Your Web site is your most valuable marketing tool. It connects to your customers. 24 hours a day, 7 days a week it display your wares. 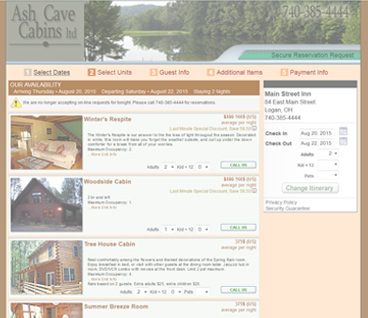 The ReservationsONLINE Booking Engine becomes part of your website and makes easy for guests to book online. What makes the ReservationsOnline Booking Engine so great? Customizable to match the appearance of your Web site. Always displays the most current availability and rates. Customizable text message areas to supply your own wording. Enforces minimum length of stay rules. Allows for multiple unit bookings. Displays multiple individual unit photographs. Allows you to ofers discounts. Validation to ensure accurate guest information is entered. Encryption for securing credit card and guest data. Verified Hacker Safe operating environment. Digital signature for guest to indicate they understand your policies. Validation of credit card numbers. The ability to sell packages and other additional items. The ability to charge housekeeping, pet and damage waiver fees. Fully customizable guest confirmation and follow-up letters. Allows you to set the cut-off time for reservations for this evening. No Commissions and no booking fees! Online bookings are immediately entered into your database. Eliminates data entry for online bookings. Click here for live demo. © ReservationsONLINE. All rights reserved.